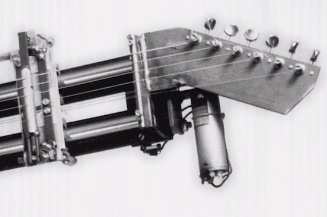 As an example I will now describe one member of the band in more detail - Aglaopheme the slide guitar robot. Aglaopheme's body is both, a robot with framework, actuators and position sensors and a musical instrument (slide guitar) with six strings, machine heads and a guitar pickup. 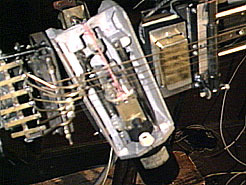 Six solenoids are used to either dampen and release or to pluck the strings. A short piece of cable tie serves as a very durable plectrum that is moved across the strings by a linear motor to pick selected strings. 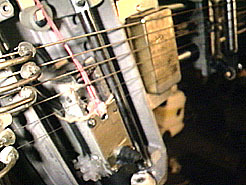 The entire plectrum-drive assembly can be pulled away from the strings by a solenoid to allow the plectrum to drive to the desired strings without hitting any others. A dc motor drives a sledge up and down the guitar neck. This sledge carries the slide and a small solenoid that pushes the slide against the strings if necessary. The sledge also carries a small video camera. Two more video cameras are attached to the machine. One is located at the lower end of the guitar neck. The other one is mounted on top of a leg-solenoid. Two big solenoids serve as legs to the robot. They can push up the entire framework in two different directions and thereby make the robot rock. This rocking motion also moves the whaa-whaa pedal up and down. Aglaopheme's main behaviour control is composed of six artificial neural networks that control one guitar string each. The neural nets compete in being in control of the robot's mechanics. The network that, at a given time, has the most definite answer to the current sensory input is allowed to generate a command to be sent to the robot controller. When the robot first started playing in december 1992, the six neural network that control the machine's behaviour were randomly initialised. Today there are several different sets of networks available for different modes of operation (different speeds and tunings). All these sets are descendants of the primal neural nets from 1992. This means that the robot system now has the experience of about ten years of playing. Not constantly but regularly. The network model used in this system is a variant of the so called Self Organizing Maps (SOM) originally introduced by Tuevo Kohonen [Ko]. A weak inhibitory mechanism was added to the network model in order to avoid excessive feedback. 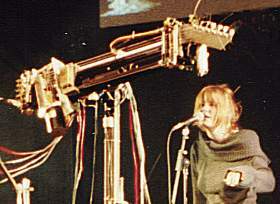 The sounds generated by the six guitar strings are converted to electrical signals by a guitar pickup, which are then fed into a whaa-whaa pedal that is operated by the motion of the robot's body. The resulting signal then runs through a distortion effect box and an audio mixer before being digitised by a computer that performs a spectrum analysis of the guitar sounds. The resulting spectrum information is transmitted via ethernet to another computer where it serves as sensorial input to the six neural networks (see The Brains). The neural network in command now sends it's response to the robot controller where the mechanics are instructed to make a movement that will result in new sound being generated. The control loop is finally closed and the system can begin to learn by playing. When listening to the robot's play, it soon becomes apparent that the machine has a strong preference for the blues (in the Hendrix's sense). This first seems to be surprising but by carefully studying the basic conditions of the system one may find good reasons for this observation. First of all the tuning. For slide guitar players it is very common to use so called open tunings. This means that the strings are tuned to a chord (preferably something with maj.7 in the end), something you don't do for normal guitar playing. I have experimented with various tunings and the one that the system seems to like the most (or rather, the one where I like the system's performance most) is the chord D#maj.7. This chord clearly is a blues chord as it contains the typical blues harmony. A second prerequisite for the system's affinity with blues is the guitar string itself. By looking at the first few harmonics in the overtone spectrum of a vibrating string one finds that the first and third harmonic (unequal the fundamental) are the fifth (=tone 5 above fundamental) and that the seventh harmonic (unequal the fundamental) is the forth (=tone 4 above fundamental). Both intervals are essential for the blues scheme. Another interesting candidate is the fourth harmonic (unequal the fundamental). This tone turns an ordinary chord into a …major7 chord when added. This type of chord is heavily used in blues music.